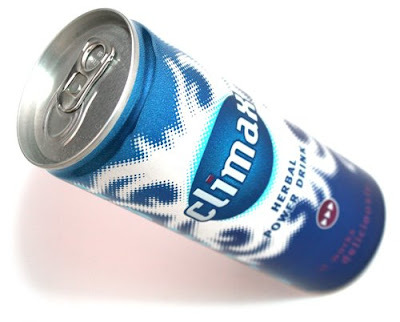 Climax Herbal Energy Drink, if you think you recognize this, you are correct this 25cl can of herbal engergy drink already exist since around 2000. Back then it was called Xi Climax Herbal Energy Drink. However it have never been a hit since it had to compete with Red Bull and Gremlin energy drink back then. However I am not sure if they are planning to return this to the Dutch market though however I notice this can is produced in the Netherlands and is also a Dutch product, but this one is imported. The can has no Dutch info printed and needed and extra sticker for the Dutch info, but actually not seen it in any other country though. For the taste, it is same as the other taurine but with a bit of light herbal taste. The herbal taste just made it less tasty, but the ingredients are pretty much the same as other taurine products. The design is pretty much the same ask the old one however they removed the Xi logo and just used Climax instead. Might be because they just have one flavour and looks bit odd to have a subname. But the looks can easily stand tall with the rest but I think they need to do something more with the taste. Cause my favorite Taurine based energy drink is Go Fast cause by the special and unique taste. Climax is available in The Bahamas,we drink it here all the time.